Rumor: Wildlife organizations have issued a plea for crafters to knit sweaters for oil-soaked penguins. Claim: Crafters have been asked to knit sweaters for oil-soaked penguins. who live on Phillip Island near Melbourne, Australia, such accidents and illegal activities have threatened the entire population of penguins. Cleaning the animals by hand with warm water and a mild detergent then returning them to their natural habitat has been found to be an effective means of dealing with the danger posed by oil spills, but there’s a snag in the plan: Often the little penguins are far too ill to be bathed right away, and the scrubbing can be quite stressful. One solution proffered several years ago was to slip the oil-coated birds into wool sweaters to prevent them from preening themselves and possibly swallowing toxic petroleum-based oil as they regained needed strength, and to keep them warm until their bodies were once again producing the natural oils (removed by the cleaning) necessary to their insulation. But where would get such penguin attire? Appeals were made to the knitting public to place their time, skill, and leftover yarn into the service of animals in need. A New Year’s Day 2000 spill of 260 gallons of fuel oil off the southern tip of Australia prompted an appeal that resulted in piles of sweaters (“jumpers,” in Australia) being sent to aid the damaged little birds, many crafted by the capable hands of American knitters. To be better prepared for the next such environmental crisis, in 2001, the Tasmanian Conservation Trust and State Library ran the knit-for-a-penguin campaign. They hoped to build a stockpile of 100 sweaters. They got more than they bargained for. action, deciding to ask the knitting public for an additional two thousand penguin sweaters. Hundreds, perhaps even thousands, of sweaters have been lovingly knitted and donated to help the little blue penguins coated with oil stay warm — but the outfits won’t be used. The countless hours spent by people selecting colours, designing patterns and knitting the costumes has only resulted in idle piles of the woollen outfits, unused and unlikely to be used. A Maritime New Zealand spokesman for the oiled wildlife centre in Tauranga said they had received a box of the handmade sweaters and that should be more than enough. A keeper at Auckland Zoo said the idea of making the little birds wear the jerseys might cause them extra stress. Miss Clark said she had never seen a vest on a penguin and she wondered how much the birds would appreciate the costuming. “Putting something like that on a penguin, it’s probably only going to stress it out even more than they already are. These are wild penguins, they haven’t had any interaction with humans. There’s already enough stress on a bird without trying to put a sweater on it,” she said. Maree Buscke of Skeinz.com, which helped to organise the knitting scrum, said the sweaters were a way for people to help, even if they weren’t going to be used. She was still receiving sweaters from knitters, she said, plus turning down more offers to help. To help the birds stay warm and limit the amount of preening, we only have to do one thing — house birds in a warm, ventilated area. When birds are warm, they reduce their preening because they’re comfortable. When they’re cold, they’re stimulated to preen in an attempt to correct the loss of body heat. Our research and experience over the course of hundreds of spills has shown us that when we keep them warm while they are still oiled, birds do well. There’s also another hazard to the sweater concept: Any handling or wearing of anything foreign to them contributes to the penguins’ stress. Reducing stress is our biggest challenge in an oil spill. Sweaters can be cumbersome, and require a secure fit to ensure that the bird will not become entangled. When birds are kept in warm rooms without sweaters, their stress is reduced, because they do not need to be monitored or handled. In the Treasure oil spill in 2000 in Cape Town, South Africa, International Bird Rescue worked with the International Fund for Animal Welfare (IFAW) and the South African Foundation for the Conservation of Coastal Birds (SANCCOB) to rehabilitate over 20,000 oiled African Penguins; we successfully released 95% of them. In every oil spill where we have cared for penguins, International Bird Rescue has had at least an 80% release rate, and none of these birds wore sweaters. Our colleagues from around the world agree that penguin sweaters are adorable and offer an avenue for concerned people to contribute, but they are not considered a useful tool for the rehabilitation of oiled birds, primarily penguins. We have a good stockpile of jumpers suitable for rehabilitation purposes which we also distribute to other wildlife rescue centres where need be. Little penguin jumpers are also used as an educational tool to teach students and others about the devastating effects marine and coastal pollution has on marine wildlife and the environment. Please know that we do not urgently require little penguin jumpers for rehabilitation, we have a good supply of these which we use on any rescued oiled penguins and in the event of an oil spill, these jumpers are also sent to other wildlife rescue centres if required. Q. What’ll happen if I knit a penguin sweater? A. Odds are it’ll be used to dress a toy, not a real penguin. When charities got inundated with sweaters last time, several started using the extra sweaters as fundraisers — they use them on stuffed toy penguins, and the sales of those benefit the charity. That’s what’s happening here. The money raised helps wildlife conservation. The Penguin Foundation also uses the sweaters in its educational programs. Q. Bottom line: Should I knit a penguin sweater or not? A. Your call. There’s no wrong answer. It’s an easy project, it’ll definitely help penguins and it’s a fun way to introduce children and rookie knitters to the joys of charity knitting. 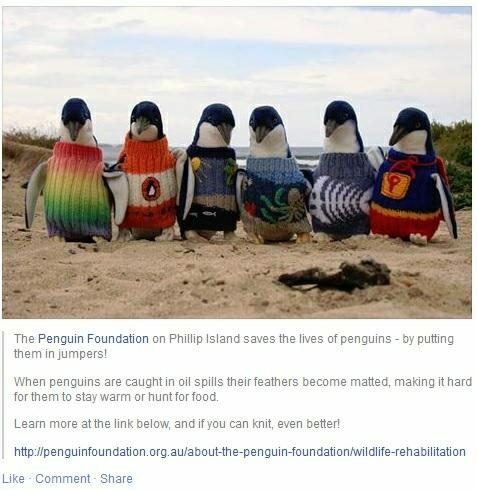 So if you really want to knit a penguin sweater, go to it — but bear in mind that the cost of shipping it/them to Australia won’t be cheap, and if you want to help the birds, you might just want to donate funds directly to the Penguin Foundation. Bay of Plenty Times. 21 October 2011. ABC Melbourne. 6 March 2014. Duluth News Tribune. 7 June 2000. The Oregonian. 6 March 2014. [Dubuque] Telegraph Herald. 11 April 2000 (p. A1). 9 February 2001 (p. 17).